Branch manager sounds cool, doesn’t it? The classy job title attracts a lot of people. More often than not, you will compete with a dozen other job seekers in your interview (or with more). You should prepare for a long interview sessions, consisting mostly in screening and behavioral questions. Some technical questions and a personality test can sometimes catch you off-guard, but you won’t necessarily deal with them in your interview. 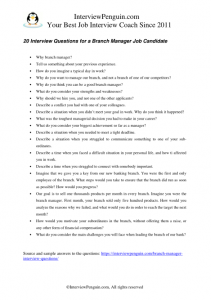 Let’s have a look at the four parts of the common interview process for branch manager job. Interviewers use them to understand your motivation, your communication skills and other soft skills. Basically they try to get a good grasp of your personality-who you are, what you do, what you dream of, what you want to achieve in your life. Asking these questions, the interviewers will test your readiness for the job. They also try to understand your attitude to various work-related situations, and to challenges you can face in your daily job. Describe a situation when you didn’t meet your goal in work. Why do you think it happened? What do you consider your biggest achievement so far as a manager? (The key is to focus on the achievement of the company–to which you actively contributed with your work. Do not talk about personal promotion, or employee of the month award. Talk about something you did for them, something great. Describe a situation when you needed to meet a tight deadline. Describe a situation when you struggled to communicate something to one of your sub-ordinates. What did you do to get your message over? Describe a time when you struggled to connect with somebody important. Special Tip: Many people struggle with behavioral questions, especially when they apply for their very first job. Imagine that we gave you a key from our new banking branch. You were the first and only employee of the branch. What steps would you take to ensure that the branch did run as soon as possible? How would you progress? Our goal is to sell one thousands products per month in every branch. Imagine you were the branch manager. First month, your branch sold only five hundred products. How would you analyze the reasons why we failed, and what would you do in order to reach the target the next month? How would you motivate your subordinates in the branch, without offering them a raise, or any other form of financial compensation? What do you consider the main challenges you will face when leading the branch of our bank? As if the screening, behavioral, and technical questions weren’t enough, you may deal with a personality test, and sometimes also with an IQ test in this interview. I know it is not east, but the employers have no other choice. A complex interview is the only way how they can uncover some important and some minor differences between you and other people who apply for the job. Success (or failure) is not a question of luck, however. The better you prepare for your interview, the greater your chances to succeed will be. Check our Interview Success Package to learn something your competitors won’t know, and gain a competitive edge in your interview. We wish you good luck! InterviewPenguin.com – Your best job interview coach since 2011. Body language in an interview – What do your gestures and movements say about you? Can we control our non-verbal communication? Learn more about your body language in an interview. Informational interview – Get information about the employer beforehand, and benefit from them in an actual interview for a branch manager job.